On July 12, 2012 the Time magazine published a story titled “In Saudi Arabia, Dissent Is Alive and Well, but Only Online or in Private”. The video that accompanied the story shows Saudi rights lawyer, Waleed Abu al-Khiar, on frame 43 second, saying “Every day I say to myself they will arrest me”. On 15 April 2014 Waleed was on his way to appear before a criminal court in Riyadh after a court in Jeddah sentenced him in October 2013, to three months in prison, but never implemented the sentence. The Riyadh court session was supposed to be the fifth in Waleed’s appearance before the criminal law specialized in terrorism cases. Charges against him were about “contempt of judiciary”, “communicating with foreign entities”, “disgrace of country reputation through the media” and finally “incitement against country’s regime”. How and why these are “terrorism-related” charges is not puzzling in a country where law has never been defined, and maybe not entirely surprising in an environment that showed no tolerance for dissent. On that day, Waleed’s phone never answered incoming calls and no one knew if he was arrested for that sentence or because of any other charge. 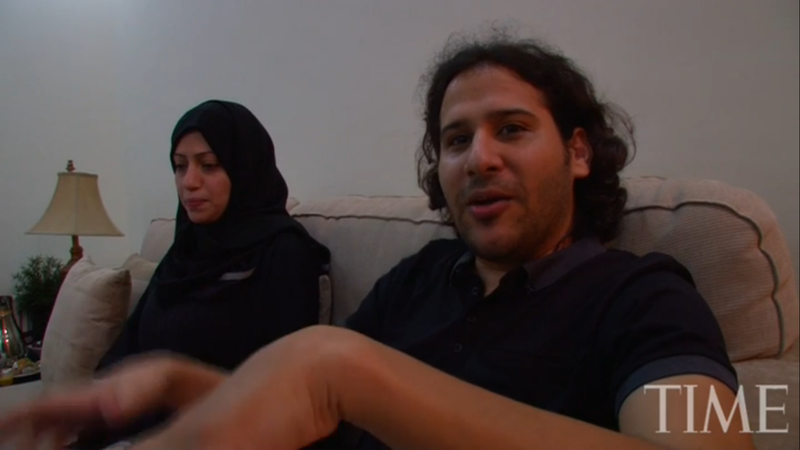 Next day, wife Samar Badawi traveled from Jeddah to Riyadh where the court told her that he was arrested and transferred to the notorious al-Hayer prison. She was not allowed to communicate or speak to him upon arrival at the detention facility. When Human Rights Watch reviewed charge sheet against Wlaeed, it found out that it hardly contain anything but little extracts from statements he gave to a number of different media in addition to critical tweets from his timeline on twitter. The sentence “shows how far Saudi Arabia will go to silence those with the courage to speak out for human rights and political reform”. Amnesty International framed his arrest as part of “ongoing crackdown on dissent” and as punishment “for his work protecting and defending human rights”. He is a “prisoner of conscience” Amnesty conclude.